‘Woodworm’ is a blanket term used to describe various types of wood-boring beetle larvae. Found in many different habitats throughout the UK, woodworm can be found in forests but can also live deep in timber that is used for construction in homes and buildings throughout the country. If you’re searching for ‘woodworm treatment Bristol’, get in touch with our timber preservation specialists today. As a leading damp proofing specialist across the South West, we provide professional advice and treatments for homeowners, agents and commercial businesses. Get in touch today on 01793 272085. People often think of the common furniture beetle when referring to woodworm. Also known as Anobium Punctatum, the larvae of this beetle live deep within the timber for several years and will eat through the wood before finally emerging as an adult woodworm beetle. 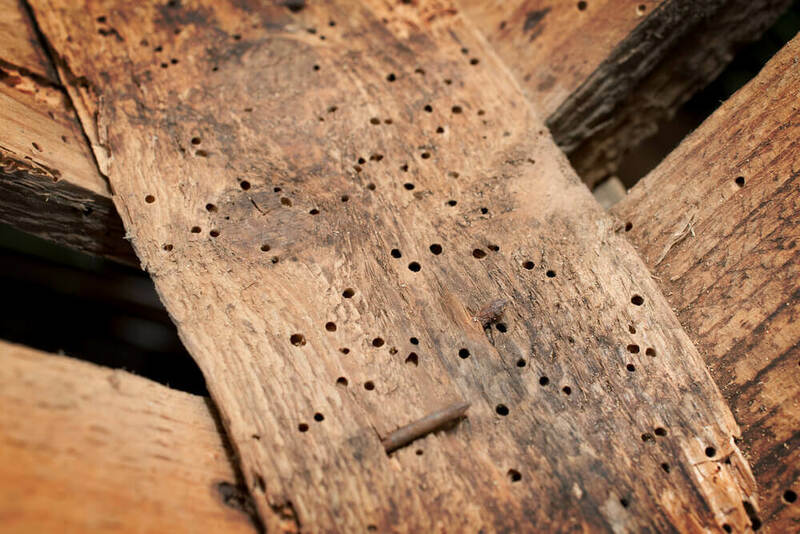 With years of experience providing woodworm treatment Bristol, our timber treatment specialists can identify early signs of timber deterioration and begin treatment before irreversible and structural damage occurs. You can identify signs of woodworm in timber when ‘frass trails’ and exit holes begin to appear in the wood. Woodworm often attacks softwoods and specific hardwoods and requires the wood to be of a specific moisture level to survive. When carrying out a woodworm survey, our timber treatment specialists are experienced at spotting signs of infestation in floorboards, rafters and timber structures. Before carrying out woodworm treatment Bristol, the Biocraft team will determine if there is a current, active attack before carrying out any chemical timber treatment. Below, we look at the lifecycle of the woodworm beetle, how your timber can become infested, and next steps in effectively managing an outbreak. Infestations occur when adult beetles lay their eggs in timber that is suitable for their larvae to grow. Once hatched, the woodworm larvae could spend anywhere between 3 to 5 years eating away and burrowing through the infected timber. Damp or moist timber provides a habitat for woodworm larvae to thrive, as there is an abundance of nutrition and moisture for them to feed from. When they are grown and ready to emerge from their feed, exit holes can be seen in affected areas of the wood. When carrying out woodworm treatment Bristol, woodworm larvae tend to pupate and emerge from the timber between March and September time. Our expert team are experienced in carrying out comprehensive woodworm surveys to identify and areas of infestation. Often located in old buildings, identifying the correct type of woodworm that has infested and attacked the timber is essential when deciding on an effective course of action. After analysing the results of a timber or wood survey, our experienced team can identify the most effective course of timber treatment Bristol. In many cases where woodworm larvae have been or are present, there may be no need to carry out chemical woodworm treatment. If the survey identifies woodworm larvae currently in the timber, a specialist timber treatment will be required – depending on the type and extent of damage caused by the larvae. One of the most common and effective courses of treatment is the application of a preservative spray. For areas in your home or building that are difficult to reach, there is the option to conduction ‘micro fogging’. All timber treatment Bristol is carried out by trained and experienced timber treatment specialists at Biocraft South West. All work carried out on your property follows strict guidelines and standards set by the PCA Code of Practice for Remedial Timber Treatment. With specially formulated preservatives for each project, the Biocraft team can provide effective and successful woodworm treatment Bristol. For more information or to book a survey, call our team today on 01793 272085.